A free fragment, also known as a sequestered disc, is one type of herniated disc in which a piece breaks off from the main structure. Once separated, the detached fragment can, and often does, move up or down, causing symptoms or repercussions at an entirely different level of the spine. Symptoms, which are called radiculopathy, generally result from contact between the free fragment and spinal nerve root, whether this takes place where the sequestration (breaking off from the main disc) first occurs, or at the level to which the fragment subsequently migrates. A herniated disc is caused by a fray or break of the outer fibers of a spinal disc that normally contain the soft liquid shock absorbing substance inside the disc. This substance is called the nucleus pulposus. When the fibers tear, the nucleus pulposus may extrude, or come out. 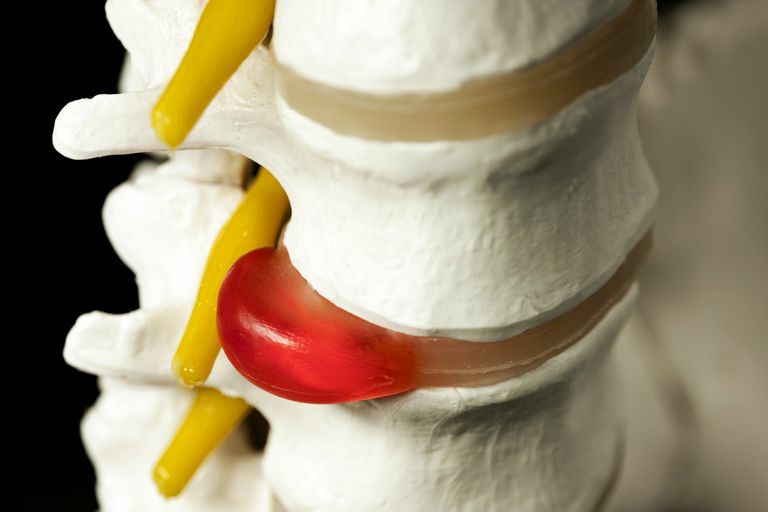 There are several types of herniated disc, and they correspond to the possible progression of the nucleus pulposus as it makes its way out from the center of the disc. These types, or phases, are protruded, which is also known as bulging, prolapsed, extruded and sequestered. Sequestered is also called free fragment. As with any herniated disc, radiculopathy symptoms caused by a free fragment may present themselves in one extremity. The location of the free fragment determines which extremity experiences symptoms. If the free fragment is in your neck area, you'll likely experience symptoms in one arm. If it’s in your low back, you'll likely experience symptoms in one leg. Symptoms may include pain as well as nerve-related sensations such as pins and needles, burning and/or electrical shock. Other possible symptoms include leg weakness and/or numbness. If the thought of a sequestered disc makes you want to rush out and get some back surgery, it may first behoove you to know that conservative care, which generally consists of medication and physical therapy, may help you fully recover. A small 2002 study found that non-surgical treatment for herniated discs, especially those that have sequestered, may be surprisingly successful. Over 75 percent of the twenty-two participants in the study, regardless of what type of herniation they had, reported positive outcomes without the use of surgery. For most of the eleven patients with the sequestered type herniation, the migrated fragments disappeared altogether. And for the remaining study participants with the sequestered discs, MRIs revealed definite decreases in the free fragment sizes. A 2017 meta-analysis published in the journal Pain Physician not only confirms the study's findings but also reports what they refer to as a well-known fact — that 66.66% of disc herniations spontaneously resorb. Resorption occurs when the body's tissues that come into contact with the free fragments secrete substances that chemically break down the disc pieces. The broken down disc material is, over time, re-absorbed by the body. While going the conservative route may help you avoid the stress and uncertainty of an invasive procedure, keep in mind that it may take much longer to get significant pain relief and symptom abatement. If you have a sequestered disc, and you're thinking of going the conservative care route, you may be in luck. This is because the more progressed a herniation is, the more likely it is the disc will spontaneously resorb. A study published in the February 2015 issue of Clinical Rehabilitation found that both the extrusion and sequestration herniation types have a higher probability of spontaneous resorption than do disc bulges and protrusions. The study also found that in comparison to bulging, protruding, extruding, prolapsed discs — in other words, all the other progressive phases of disc herniation — free fragments and sequestered disc have a higher probability of complete remission and resolve of the condition. And finally, the standard surgery for a simple herniated disc may not work for your sequestered disc. Not only may locating the free fragment or fragments responsible for your symptoms be extra challenging for your surgeon, but at least two invasive procedures, percutaneous discectomy, and chemonucleolysis have been identified by experts as, at best, ineffective, but, worse, potentially harmful. An article in the October 2016 issue of the Asian Spine Journal warns surgeons that while laser disc surgery is fine for an uncomplicated case of herniated discs, it's not recommended for sequestered discs. And if you an underlying back problem that makes your spine unstable, the authors say, laser surgery is, likely not a good choice of procedures, even for a simple herniation.